Did you miss my Summer Fun Series Part One post? About time flying and trying to fit a bunch of awesome stuff into this summer? Be sure to check it out if you didn’t already. Well, this past Wednesday, Molly and I went to the cheap theater again (see Summer Fun 1 if you don’t know what I’m talking about!). We saw Pitch Perfect 2. If you didn’t see Pitch Perfect, don’t see Pitch Perfect 2, or you’ll have no idea what the point of the movie is. If you have, and you are part of the Pitch Perfect fandom, you’ve got to see it! We were cracking up the entire movie. This movie is rated PG13 and it is rated that for a reason which you can find on IMDb. There were people with their little kids there, and I was thinking, “What are you thinking!” But each to his own. The dialog is not for kids, but it is hilarious for those of us who are more mature 🙂 Not old…just mature lol. Elizabeth Banks and John Michael Higgins are so funny as the emcees of these a cappella events. And the singing itself is amazing! These actors are seriously talented. Not sure what we are going to be doing this coming week, but hopefully it will be something fun enough to share with you. Maybe Kyle will actually want to spend time at home…or maybe not. The saga continues……. Did you do anything exciting this week? This summer? Ever? Share it! I love Taylor Swift. I think she is such a. Awesome role model for young girls. And there are so few good ones out there. I really like Taylor Swift. She not only has a beautiful voice, from what I’ve heard she has a beautiful personality as well. ‘Sounds like your summer is off to a great start! I worked. A lot. =D I did see Pitch Perfect 2 when it came out, though. It was just as great as the first one! It sounds like you had a wonderful time! You can’t beat a weekend filled with Taylor Swift and Pitch Perfect 2. Yay! I’m so jealous! I really wanted to go see Taylor Swift this summer but in my house full of guys, it wasn’t cool! I should have gone with the girls after reading what a great time you had! Definitely go next time she tours! You will not be sorry! I’m anxiously waiting to see Pitch Perfect 2. Can’t wait!! And Oh my Goodness. Taylor Swift! I’m in girl love with her! It is hilarious! If you liked the first, you’ll love this! Yeah, Taylor is amazing! I can’t wait to see Pitch Perfect 2! I am always surprised when there are children at movies that are clearly for adults! I know! It is totally not appropriate for kids…unless they sleep through the movie lol. I am soooo jealous of y’all! I would love to go see Taylor Swift one day! She puts on an amazing show! I love Taylor Swift! What a wonderful time you had. I would love to watch her in a concert. I hope you get to see her in concert! I have a few work collegues who went to see Taylor Swift with their daughters…and they loved it as much as their daughters did!! That is awesome! It was an amazing show! I’m a big fan of Taylor Swift songs. You’re so lucky you’ve seen her. I’d love to see her one day. And OMG I can’t wait to watch Pitch Perfect 2! Hopefully you’ll get to see Pitch Perfect 2 soon! I can’t help but love Taylor and her positive messages. She is always in the media but does a good job at staying “normal” as best she can. Yes, she does! I hope her character is strong enough to keep it up throughout the years. I recently became a fan of Taylor. I like her music….My girls are responsible for that one!….. 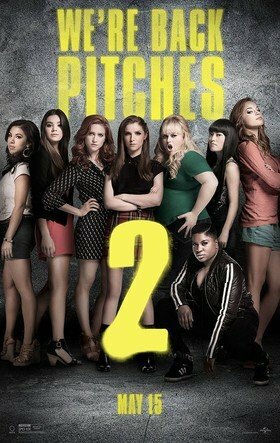 I also cannot wait to see pitch 2. The first was a riot! You’ll be cracking up at the 2nd one too! I haven’t seen the first moview yet and I would love to see it before the number 2. That would be fun to watch. Yes, for sure watch the first before the second so you can know what is going on! I haven’t seen Pitch Perfect, but I do like that girl who sang The Cup Song. She def. has a great singing talent. Yes, she really is multi-talented! Ours was pretty good too! I saw on FB where one place had a computer malfunction and 7,000 fireworks went off at the same time! Yikes! Ahhhh I tried for years to be a Taylor hater because I’m anti most Main Stream things… I don’t know what it is about her though but you just can’t hate the girl lol… This is going to be a cute movie . I would love to go see Pitch Perfect! Maybe I’ll make some time to do that this week! It is cute and funny! My daughter, sister, and I are total Pitches! Loved the first one and saw the second one right before it came out. Surely didn’t disappoint. So funny! My daughter would love to see Taylor Swift in concert. I’m glad that you and your daughter got to go see her. I am trying to spend as much time as possible with her since I know she’ll be on her own sooner than I want! I love Taylor Swift, both for her music and her wholesome image. She is a role model I like my kids looking up to. This concert is definitely one we’ll always remember! My niece is a huge Taylor Swift fan. She is just dying to go to one of her concerts. Maybe for her next birthday. She also loves the Pitch Perfect movies. That would be a fun aunt/niece outing!